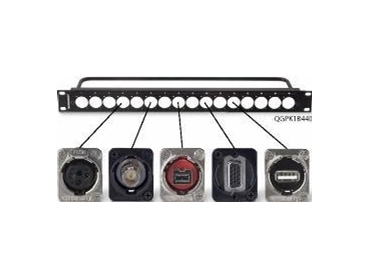 The EH series by Switchcraft, available from Clarke & Severn Electronics , is a line of audio, video, and data connectors built into standard panel-mount XLR housings. Custom combination of EH series connectors can be loaded into any of the Q-G series panels. Once mounted, connecting the equipment to the back of an EH series connector is fast and easy. Most connectors are feedthru, which means standard cabling is simply plugged into the back of the gear, then plugged into the back of the EH series connector. For those EH series connectors that are not feedthru, solder lugs are clearly marked for simple, secure solder connections. All EH series connectors are available individually, bagged with mounting screws. Q-G series panels come standard as 1RU (1x16), 1.5RU (1x16), or 2RU (2x16). 1RU and 1.5RU versions allow for any combination of up to 16 EH series connectors to be loaded into the panel. The 2RU version can accommodate up to 32 EH series connectors. Every Q-G series panel includes quick change designation strips for easy connector identification. Switchcraft's EH series is the fastest and most versatile way to create a custom panel or wall plate perfectly suited to meet the needs of any studio, broadcast facility, or systems integrator. Customize your studio, make it easy to access your I/O's, and increase the lifespan of expensive pieces of equipment using EH series connectors and Q-G series panels from Switchcraft.